Everyone remembers special foods that they ate growing up. Some of them were prepared with love by family members or neighbors. Some were snacks purchased at the grocery store. Case in point, Nabisco Animal Crackers, which were more like cookies to me. My mom used to buy me a little box of them at the grocery store and I ate them throughout the store while she shopped. I remember the bright, red box and the folded over bag inside the box aimed at keeping the snack inside it fresh and ready to be consumed by eager toddler fingers. I would also study the outside of the box with the animals on the outside and tried to match the cookies to the picture of the animals on the box. That's a special memory. Now, Nabisco has gone and ruined it. I wish this was satire. Oh, how I wish. Today's headline reads: "Nabisco animal crackers uncaged after 116 years". Really? 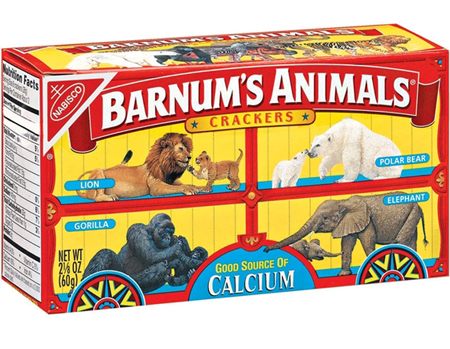 After receiving some pressure way back in 2016 from those loving, caring people at none other than People for the Ethical Treatment of Animals, also known as P.E.T.A, the cracker conglomerate has decided to depict the circus animals on the front of that cute, little red box without the cage bars in front of them. I can't. My evens. My childhood. Y'all, PETA is the same group that actually KILLS animals. In fact, they don't want people to 'own' pets at all. The co-founder of PETA, Ingrid Newkirk, has been quoted as saying that, “In the end, I think it would be lovely if we stopped this whole notion of pets altogether." I'll recognize that there is abuse of animals and that's absolutely uncalled for, but the hypocrisy of this group is just astounding. What could even be more astounding is that they have the kind of influence to change the face of a harmless picture of circus animals on an iconic snack. Way to go, Nabisco.